Includes all travel permits required during this tour, 4/5 stars hotel, Breakfast, Chinese/English speaking guide. Arrival in Lhasa, warm Tibetan style pick-up and transfer to hotel for acclimatization, or you can have your free time hanging out at this holy city to get the first impression of Tibet. 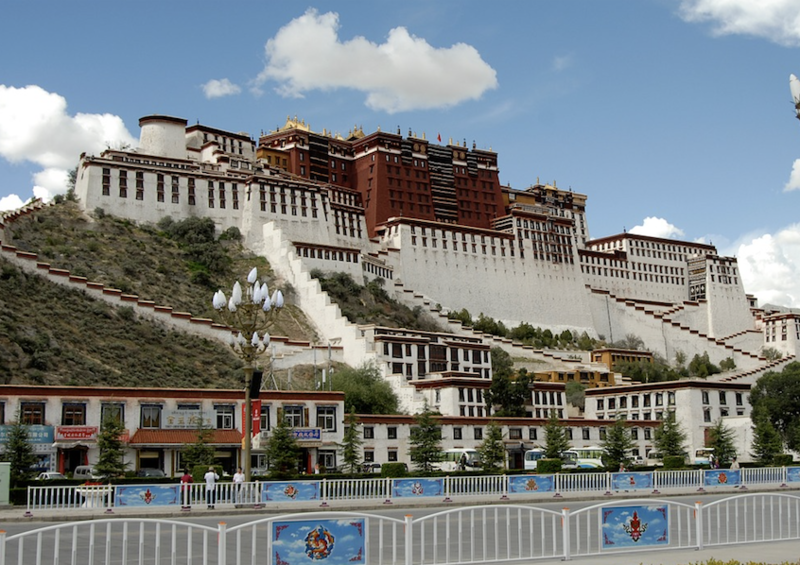 In the morning, visit the symbol or landmark of Lhasa-Potala Palace, the successive Dalai Lama's winter residence. In the afternoon, visit the center of Tibetan Buddhism-Jorhkang Temple, where you will come across lots of devoted pilgrimages coming from every corner of Tibet. Both sites are under the list of the world cultural heritages by the UNISCO. In the morning, we will visit Drepung Monastery which is the biggest Tibetan Buddhism College with the biggest number of monks in Tibet. The monastery used to be the winter residence of the Dalai Lama before the 5th Dalai Lama moved his residency to the Potala Palace. And in the afternoon, we will visit another influential Gelugpa Monastery-Sera Monastery, where the largest scale of scripture debating among monks is famous all across Tibet（Monday to Friday）. We will watch the debate session and you may join in too with the help your guide. In the morning, drive to the historic town of Gyantse via Yamdrok Lake, according to local mythology, Yamdrok Lake is the transformation of a goddess, on the Gangbala Pass, you will have a clear picture of this Tibetan holy lake in turquoise, in distance you can also see the snow capped Summit of Ninjingkangsang. In Gyantse, you will find the largest stupa in Tibet-Kumpa Stupa (Ten-thousand stupa), just next to the Stupa is the Pelchor Monastery. Another important site in Gyantse is Dzong Castle which once was a battle field where Tibetan fought against British invasion. In the morning after breakfast, our guide will go to tourism bureau in Shigatse to apply for PSB permit for Mt. Everest, which will take about 1 hour. After obtaining the permit, we will drive directly towards Mt. Everest. On the top of the Gyalpo-la pass you can see 4 of the highest mountains over 8000 meters (Mt. Everest; Mt. Makalu; Mt. Lotse; Mt. Cho Oyu) in the world at the same time, what a great picture. Before arriving at the EBC, you will first visit the highest monastery in the world-Rongbuk Monastery, which is also a good position to watch the Everest, the sunset view is fantastic when weather is good. Wake up early in the morning to view the very fantastic sunrise over the peak of Mt. Everest. After breakfast, you will have opportunity to hike at the EBC to discover the charm of the highest place you may reach through your life, if you think hiking is too tough, you can just take the green bus to the EBC. And we will drive back to Shigatse this night. : In the morning, visit Tashilumo Monastery which is the seat of Panchen Lama, the equally important religious figure in Tibet as Dalai Lama. The monastery was built by the first Dalai Lama in 1447, and inside the Monastery placed the highest statue of Buddha in Tibet which is 26.8 meters high. Afterwards, we will drive back to Lhasa; the free time is on your own. Tour ends, our guide and driver will drop you off at airport or railway station in Lhasa. Welcome to Tibet next time. 1. All travel permits required during this tour. 2. Well maintained tourists’ vehicle throughout the tour. 3. Private airport/ train station transfer. 4. Local licensed Tibetan English speaking tour guide. 5. Entrance fee to all the scenic spots mentioned. 6. Oxygen supply on the vehicle. 7. Travel insurance only for accident. 8. Government tax and travel agent’s service fee. 9. One bottle of mineral water per person per day. 10. Accomondation including breakfast as shown below. Tips to driver and tour guide. Single room supplement fee if you travel alone and occupy a single room. Bank service fee when you transfer deposit to our company. ***Should Tibet closed due to politic or natural reasons, we would refund your deposit in full, however, we shall not take any responsibility of your financial loss on international or domestic air or train ticket cancellation penalty. note：please send your passport copy and China visa copy two weeks in-advance!